This is a mural I created for a client who wanted an ocean view! 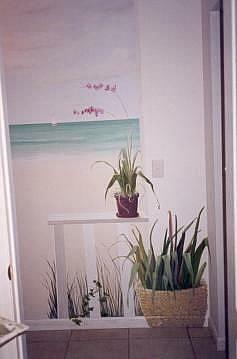 It is in the hallway off of the kitchen going into the laundry room and powder room. She changed out the overhead light fixture into an outdoor lantern type so it really has the feeling of an outdoor porch overlooking the ocean.